Cost: £110 (includes tea, coffee, home baking. Also includes use of ink and paper). All courses will be run from 10am - 4pm and will include refreshments. A non-refundable deposit of £50.00 is required when making a booking. Please send your name, address and telephone number and also indicate which course you would like to attend. Further information including local accommodation will be sent by post. 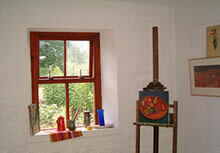 Hazel runs summer schools in her converted studio on a Galloway farm in an area of outstanding beauty. Painting for Pleasure was established in 1998 and has gone from strength to strength with many students returning each year. 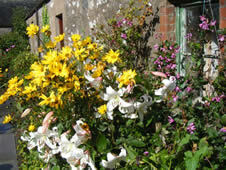 Classes are based in a converted stable beside a traditional Scottish 'back garden'. Great attention is paid to your individual needs, therefore class sizes are kept to a minimum. Regardless of your level or ability, Hazel will encourage you to develop you own personal 'style'. Or, if you prefer a little 'space' while painting then there are plenty of areas available to work alone. In fine weather, classes include excursions where you can draw inspiration from fine beaches and picturesque villages, all offering an endless variety of scenery. For 'single painter' couples, Galloway has the answer. The region is renowned not only for its 'untouched' beauty but it's wealth of activities too, so there's plenty to keep those amused who don't paint. Attractions include golf courses, ranging from inland courses to scenic links. There are also plenty of opportunities for hill walking, mountain biking, sailing, shooting and fishing. For the less energetic, there are galleries, book shops and antique shops to enjoy! Accommodation of all types is available close to Hazel's studio. Towns nearby include Castle Douglas (3 miles), Kirkcudbright (7 miles) and Gatehouse of Fleet (12 miles), all of which boast an excellent range ofhotels. Many local farmhouses also offer first class bed and breakfast facilities.